I liked The Lady’s Guide much more than The Gentleman’s Guide. It had a lot of life lessons for young women in it and it was very enjoyable. 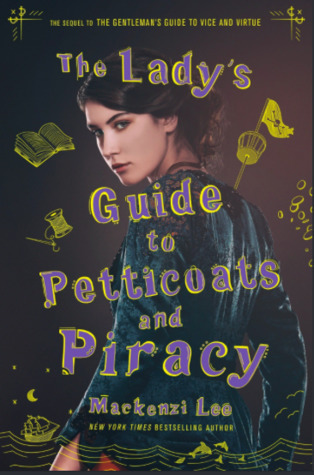 I give The Lady’s Guide to Petticoats and Piracy by Mackenzi Lee four out of five hearts because I thought it was a great read and had some actual knowledge in it for young women growing up in any age. I already loved Felicity in The Gentleman’s Guide even though she had a much smaller role in that book and sometimes felt a bit whiny. Her dreams weren’t realised by the end of The Gentleman’s Guide and still not by the end of The Lady’s Guide, but she has learned to adapt and readjusted her perspective on life. I think it is awesome. Monty and Percy were back again but had a smaller role this time. They did come to try and find the friend and sister, Felicity on the other side of the world. Which was really sweet. Although I did find their interception something of a fluke, which undermined the girls’ strength. Overall it was a great story again and it was very interesting. I do hope that this is it because I wouldn’t know what kind of stories would still be interesting to read in this world. This entry was posted in Book Review and tagged Adventure, Book Review, Drama, Fantasy, History, Mackenzi Lee, Romance. Bookmark the permalink.